The health benefits of cashews include a healthy heart, strong nerve and muscle function, aid in the formation of red blood cells, and an improved bone and oral health. They also provide relief from diabetes, anemia, and gallstones. By offering an antioxidant defense, they also encourage a better immune system. Cashews are super  nuts belonging to the family of Anacardiaceae, which includes mangoes and pistachios. They are originally native to the coastal areas of north-eastern Brazil. They are kidney-shaped seeds and are widely cultivated in places that have tropical climates. Cashews are grown in countries like Nigeria, India, Sri Lanka, Kenya, and Tanzania. The nuts stick to the bottom of the fruit, known as a cashew apple, and have diverse uses, particularly in Brazil, Asia, and Africa. Cashews are a good source of healthy dietary fats, which are essential for our body to absorb the fat-soluble vitamins A, D, E, and vitamin K and produce fatty acids that are vital for the development of the brain and blood clotting. These  healthy fats include  monounsaturated fats (MUFA) and  polyunsaturated fats (PUFA). They are good for the heart and help reduce bad cholesterol (LDL cholesterol) if consumed in appropriate amounts, even in diabetics. LDL cholesterol can rise as a result of excessive consumption of saturated fats, posing a major threat  to people suffering from cardiovascular diseases like atherosclerosis or the hardening of arteries. Studies  have demonstrated that choosing unsaturated fats over saturated fats enhances the levels of HDL cholesterol, reduces triglyceride levels, and beneficially lowers the blood pressure as well. The inclusion of nuts such as cashews, fish, and vegetable oils like olive oil and canola oil in the diet can provide these healthy unsaturated fats to the body. Cashews are a good source  of magnesium, which is vital for the healthy development of bones, muscles, tissues, and organs of the body. Magnesium helps maintain blood pressure, boost the immune system, maintain the nerve function, and keep the bones strong. It also is involved in metabolic functions, influences the insulin activity and regulates the blood sugar levels of the body. A deficiency of magnesium alters the  metabolism of calcium and the hormones responsible for its regulation. The presence of very low amounts of sugar and no harmful cholesterol in cashews makes them safe  for diabetic patients! This even helps in lowering the risk of type 2 diabetes. Research  has shown that the wealth of antioxidants like anacardic acids, cardanols, and cardols in cashews make them effective  for people undergoing treatments for tumor and cancer. Ground  cashews are a comparatively simple absorbed form of protein and are safe for patients as well. Cashews are rich  in copper, which helps in the metabolism of iron, aids in the formation of red blood cells (RBC), and helps in keeping the bones and immune system healthy. It is also vital for the nervous and skeletal system of the body. A deficiency of copper in the body may result in osteoporosis, irregular heartbeats, and anemia. 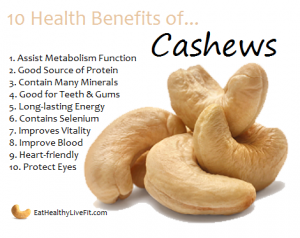 Cashews provide  phosphorus, which is essential for the healthy development of teeth and bones. Phosphorus also aids  in protein synthesis, absorption of carbohydrates and fats, and the maintenance of cellular health. Cashews are a source of dietary iron which is vital for carrying oxygen around the body and aids in the functioning of enzymes and the immune system. A deficiency  of iron in the diet can lead to fatigue, anemia, and an increased susceptibility to infections. Barring a few exceptions, they are a healthy option to be included in the diet. If consumed in appropriate quantities, they can help maintain a robust and steady state of health. Especially for vegetarians or vegans who avoid meat, nuts can stand as a good alternative to compensate for their share  of essential nutrients. Get Set and Go Nuts!